Winner of the joint ERAB / EBC grant announced! ERAB is pleased to announce that the co-application by Professors Claus Hellerbrand (Erlangen, Germany) and Ina Bergheim (Vienna, Austria) is the winner of the joint ERAB/EBC grant. Their project is entitled “Analysis of the synergistic anti-inflammatory effect of the hop derived beer compound iso-alpha-acids and xanthohumol”. In 2018, ERAB: the European Foundation for Alcohol Research and EBC, The European Brewery Convention, decided to offer a joint grant of 60,000€ over two years. The winning application was selected by a joint Advisory Board composed of brewing scientists and medical scientists from the EBC and ERAB networks. The aim of the joint grant was to bridge the technological and biomedical sciences and fund a beer specific project. The call was open for applications on technological and/or biomedical research into any aspect of the effect of moderate beer consumption on health. The Advisory Board received 22 excellent pre proposals and five were chosen to send a full application. The full applications were reviewed by a panel of experts. 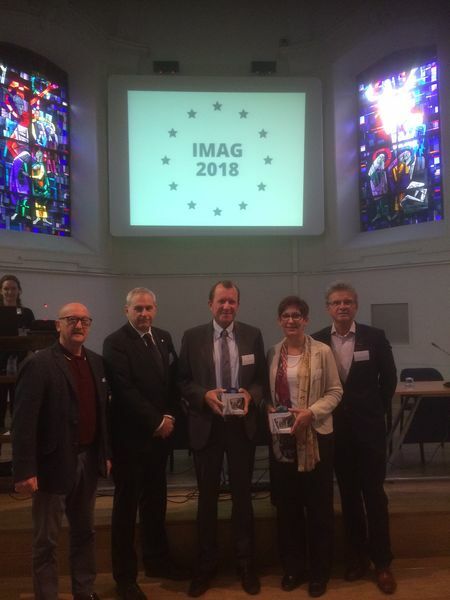 Claus Hellerbrand and Ina Bergheim were officially announced as winners of the grant on 25th September 2018 in Leuven, Belgium, during the 39th IMAG conference where they briefly presented their project. The results of the project are expected for 2020.